One of the primary pleasures of watching The Informant! 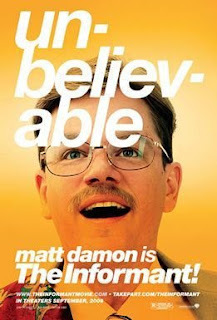 is watching corporate whistleblower Mark Whitacre (Matt Damon) uncouple like a set of pudgy, bespectacled nesting dolls. Damon gives an affably touched performance as the star informant in a 3-year investigation of agribusiness price-fixing, a forthright FBI ally who's nonetheless too candid about the full extent of the foul play and his involvement in it. His eyes are full of grandiose expectations of his role as a normal guy pulled into the spy game ("like a Crichton novel" he muses more than once) but his head is cluttered with the mundane. Damon's mind wanders frequently, via narration, to thoughts of his favorite department store chains during crucial points in his subterfuge. It doesn't help that he's prone to slipping in breadcrumbs of incriminating details just seconds before a sting operation. He's a steadfast reminder that yes, you can be your own worst enemy. It's difficult to watch The Informant! and not entertain the idea that this is Steven Soderbergh housesitting for the Coen brothers. And yet the movie is an entertaining inversion of the Coen's patented shitstorm formula. Damon is the lone wacko and everyone else - save perhaps Damon's loyal wife of shapeshifting hairdos (Melanie Lynskey) - plays straight man. They unravel Damon's catastrophe with minimal repercussions to their own lives, except maybe some lucrative overtime pay. Similarly, there's a workmanlike aspect to Soderbergh's direction. This could be the most uncool film of his career. What it lacks in show-off cinematography it gains in verisimilitude to the world of middlebrow corporate con artists. For a film based on an arcane true-life case of corporate espionage and self-sabotage, it's quite humorous. The book on which it is based has no exclamation point in its title; the film carries it like a brand. Here is a movie that makes everything exciting through sheer force of personality and punctuation. Soderbergh is curling his lip, impishly casting comedians as dowdy lawyers and G-men and having them say things that are not particularly funny. Neither is the story of Mark Whitacre, I suppose, but then there's something to be said for the way you tell a story. It's a bitter alchemy that transforms a man's troubles into dark comedy. That's what makes The Informant! a true guilty pleasure, an arresting piece of schadenfreude that holds it together far better than its doomed protagonist.